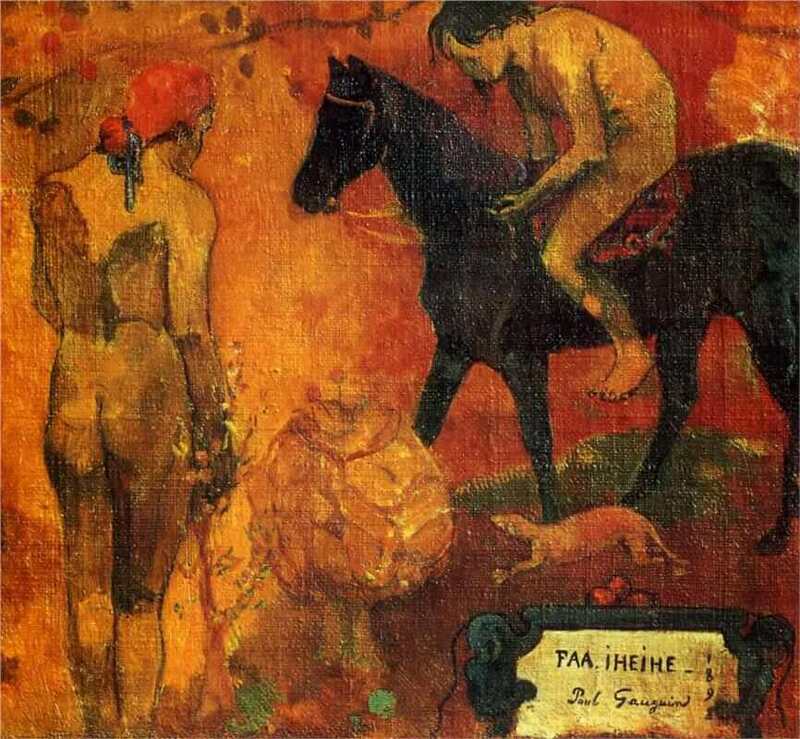 BEFORE HIS ATTEMPTED SUICIDE, Gauguin painted his large frieze of life, Where Do We Come From? . . . ; after recovering from his dose of poison, in the spring of 1898, he did this picture. The difference between the two is striking: one is an essentially sad painting, dark in color, mournful in its sentiment; this is a happy picture, bright in tone, cheerful in its feeling. The earlier subject stresses growth and decline, both mysterious, both unexplained; in this canvas there is only the one moment of eternal youth. This is a frieze too, but a frieze with a softer texture, a more even rhythm; here there is no space beyond (with all that this implies) as in the Where Do We Come From?, but instead the whole is flat. Horizon and ground, vertical and horizontal flow together to make an abstract, golden backdrop against which the figures move or are arrested in their gestures. They are not completely flat (as in the Ta Matete), but aware, as it were, of their frontal relation, half turn their heads and shoulders and feet, so that foreshortening is avoided, as it is in that Parthenon frieze of which Gauguin had a reproduction on his wall. Because Gauguin, for all that he was a revolutionary in both rhetorical pose and inner feeling, was very aware of tradition. There is here both the Parthenon and Borobudur (the central figure with the palm of her hand raised between her breasts), but the spirit is that of Puvis de Chavannes. This is Puvis' mild and tenuous golden age - in which Poussin's positive force and activity are replaced by a suspended animation - transplanted into an exotic world. Only now the spiritual, disembodied mildness has become physical languor. Through the painting itself, its warm harmonies, its continuous, closely locked design, its rough texture, this paradise has once more been brought back to earth, and made immediate and sensuous. In the words of its title, Faa Iheihe, it is "decorated with ornaments," both floral and human. It is also, as Gauguin said, "a parable" of the human spirit.